Hot off the presses! 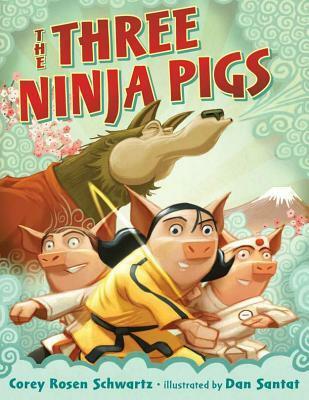 If you’ve read The Three Ninja Pigs (Rosen & Santat, 2012) you’ll remember what happened to that big bad wolf when the pigs took martial arts lessons. If you haven’t, shame on you! See my review here then run out and pick up a copy. A brand new twist on an old favorite… Now that beat-up, licked, and ticked-off wolf from the pig story, decides to take classes himself. He becomes a confident fighting machine and sets off to get a good meal. Following the traditional storyline, the wolf meets Red in the woods and sends her off to pick flowers, while he hurries to Granny’s house and disguises himself in her robe. When Red arrives, they have the familiar eyes, ears, and teeth conversation. 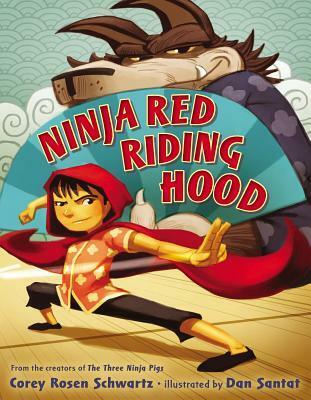 But surprise… when he jumps out of bed to devour Red, the wolf finds out that she too has been to Ninja school! A mighty battle ensues and the two appear to be evenly matched. Then Gran returns home from her tai chi class distracting the wolf just enough for Red to get the upper hand. Wolf is beaten and promises to give up red meat. Wolf and Red bow to each other and Gran offers them a peach pie. The defeated wolf decides to take up yoga instead. Corey Rosen Schwartz takes the ninja theme up a notch. She artfully weaves the ninja message and eastern culture into the popular children’s fairy tale. Dan Santat does it again! He’s a ninja-artist of the highest degree. Every scene is packed with legendary ninja action and hair-raising details. 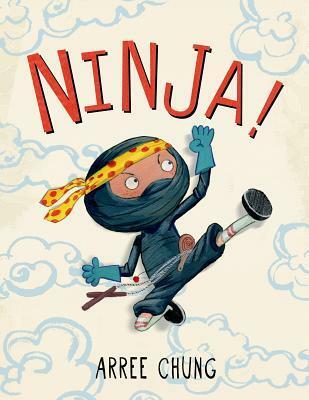 This book is perfect for little ninjas. And I love that Schwartz and Santat have teamed up again to bring us this masterpiece of ancient storytelling and modern style.